A humorous retelling of the classic, complicated love story, Antony and Cleopatra. Reason and judgment prove no match for the tsunami of mutual passion. Surrendering everything to their desires. 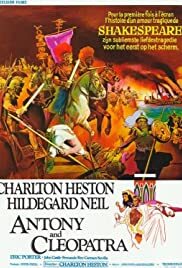 When I first saw this film I liked it very much except for Hildegard Neils performance as Cleopatra. I guess the Liz Taylor version is hard to forget. But this is Shakespeare and Ms. Neil handles the part very well. After repeated viewings, I have come around. Mr. Heston was correct in his casting. Neils Cleopatra is convincing. You can't have Antony interested in a wimpy love sick girl. This Cleopatra "acts" and gets angry, sullen and has a range of emotions. You could see why Antony would be attracted to her over the sedate but beautiful Octavia. This is a terrific film and grossly under rated. It was restored by Fraser Heston's company in 2005 but I have yet to see it's release on DVD.